All 50 Boeing 787 Dreamliners have been taken out of service. Boeing's global fleet of 787 Dreamliners has been taken out of service after U.S. regulators said they were not safe to fly until a fire risk linked to the aircraft's batteries has been resolved. With 787s already grounded by heavy users Japan Airlines and All Nippon Airways, the Federal Aviation Administration ordered all U.S.-based Dreamliners out of service. 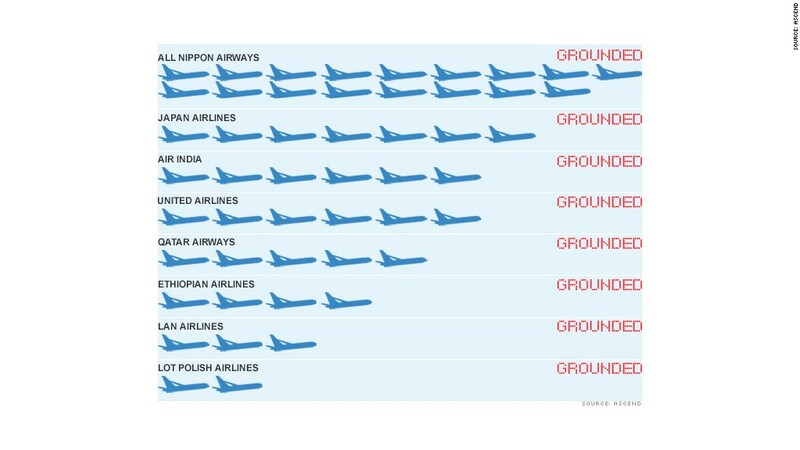 United (UAL)Airlines, which is the only U.S. carrier flying Dreamliners, said it would pull the aircraft from service, as did Air India, Chile's LAN, Qatar Airways and LOT Polish Airlines. Ethiopian Airlines' regional manager in South Africa, Yohannes Teklu, told CNN it had also grounded its four Dreamliners. Boeing (BA) shares were barely higher after falling 3.4% on Wednesday. Shares had been resilient in the face of this month's negative publicity over the Dreamliner. "Before further flight, operators of U.S.-registered, Boeing 787 aircraft must demonstrate to the Federal Aviation Administration that the batteries are safe and in compliance," the FAA said Wednesday. The agency added that it had alerted authorities in other countries to the problem. Boeing CEO Jim McNerney said in a statement that the company "is committed to supporting the FAA and finding answers as quickly as possible," and is working "around the clock" to address the issue. "We will be taking every necessary step in the coming days to assure our customers and the traveling public of the 787's safety, and to return the airplanes to service," McNerney said. Boeing said the batteries in question are made by Japan's GS Yuasa, under a subcontract to France-based Thales. Kyoto-based GS Yuasa said it had dispatched a team to Washington to help in the investigation -- a task that Hiroharu Nakano, a GS Yuasa spokesman, said should take at least several weeks to complete. The timeline for bringing the planes back into service is murky. One airline, Japan Airlines, has already said it will keep its fleet grounded through at least Friday. Michael Derchin, an analyst with CRT Capital Group, said he was "surprised" by the FAA's decision to ground the planes, but that he did not expect the issue to pose a long-term problem for Boeing. "Pretty much all new aircraft have run into some kind of teething problems," Derchin said. "Once they get it under control and the planes are back in the air and no incidents occur, everybody will forget about it. But right now, they have to deal with it as quickly as possible." Boeing has delivered 50 Dreamliners so far, and has more than 800 additional orders from airlines around the world that will take years to fill. The first of the long-delayed Dreamliners was put into service by All Nippon in October 2011, and the planes flew without major problems for more than a year. But the Dreamliners have been involved in a series of incidents over the past 10 days, including a battery fire, a cracked windshield, two fuel leaks and a braking system problem. 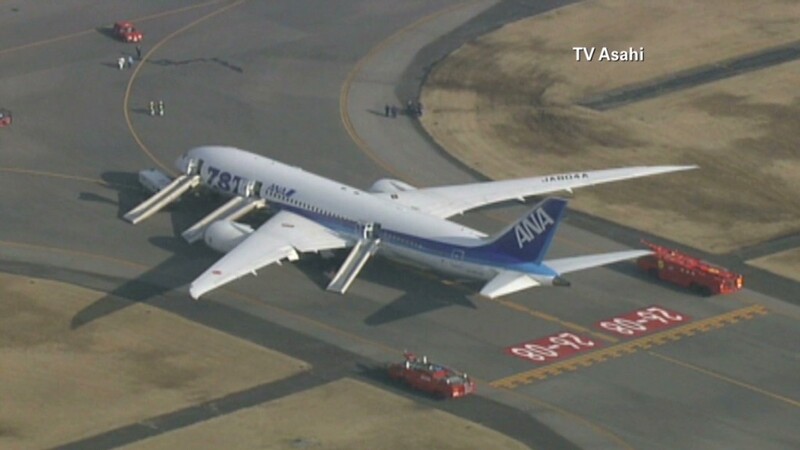 The emergency landing in Japan heightened concerns about the planes' reliability. Airlines with Dreamliners on order have so far expressed confidence in Boeing's ability to resolve the problems. British Airways said Thursday it was committed to taking delivery of its first 787 later this year and China's Hainan Airlines said it expected the grounding to have little impact on its order for 10 Dreamliners, due to be delivered in the first half of the year.